Organizations that issue credentials or certify third parties against official standards must also be formally accredited by accreditation bodies. This ensures that their certification practices are acceptable and that they are competent to test and certify third parties in an ethical manner employing appropriate quality assurance. Accreditation is especially important in countries that have a large number of certification bodies and testing laboratories. Organizations that certify third parties are known as conformity (or compliance) assessment bodies (CABs). Accreditation is an endorsement that a CAB is competent, credible, independent and honest in executing its conformity assessment activities. The terms accreditation and certification are often used interchangeably, but in the conformity assessment industry, they have very different and specific meanings. Common food safety schemes that CABs certify are quality management systems (QMS) based on the ISO 9001 standard, and environmental management systems (EMS) based on the ISO 14001 standard. 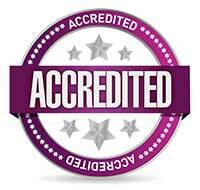 In most countries, accredited certification is not mandated, it is a choice. If a certification body is not accredited, it does not mean it is not a reputable organization. A certification body operating nationally in a specific sector might have a stellar reputation and see no advantage in going to the expense of being accredited. However, many certification bodies choose to become accredited, even when it is not mandatory, because company strategies and the marketplace, in particular, put increased value on accreditation. Accreditation bodies can be established in multiple countries, often by government or with the encouragement of government, to ensure that certification bodies are subject to supervision by an authoritative organization. Accreditation reduces risk for government, businesses and customers because regular surveillance ensures that certification bodies are independent and competent. Users of certification are protected from poor services when they are confident that the certification body they use is accredited by an body which is a member of the International Accreditation Forum (IAF). Accreditation bodies conduct regular visits to certification organizations, and observe their staff conducting food safety audits, to ensure that both the organization and its staff maintain competence in their operations. Accreditation bodies require the organizations they accredit to be free of conflicts of interest or undue influence from interests that may benefit from a certification decision. Businesses seeking food safety certification should choose a certification body that has been assessed as competent by an IAF accreditation body. The International Accreditation Forum is the international association of various accreditation bodies in the fields of management systems, products, services, personnel and other similar programs of conformity assessment. Its mission is to develop worldwide programs of conformity assessments to ensure their uniformity and their reliability as well as the competence and impartiality of accredited bodies. • to ensure that its accreditation body members only accredit CBs that are competent to do the work they undertake and are not subject to conflicts of interest. • to establish mutual recognition arrangements, known as Multilateral Recognition Arrangements (MLA), between its accreditation body members. The role of MLA is to allow companies with an accredited conformity assessment certificate in one part of the world, to have that certificate recognized elsewhere in the world. This allows certified companies to avoid having to be certified in every country where they do business. A list of accreditation bodies with their contact information and links to their websites can be found here. Generally, the websites of the accreditation bodies contain an up-to-date list of certification bodies they have accredited which can be used for selecting a certification body.